Last week I reached my kanreki and here in Japan, that calls for a great celebration with family and friends. “Kan” refers to a “cycle” and “reki” means calendar and together “kanreki” means a full cycle around the calendar or more precisely around the Chinese zodiac. Along with the 12-animal Chinese Zodiac, each person is born under one of 5 elemental signs (Wood, Fire, Earth, Metal, Water). The animal that represents the year changes with each new year, while the element changes every 12 years after one full revolution through all of the animals. These two cycles take 60 years (12 animals x 5 elements=60 years). This year 2009 is not simply an Ox year, but more specifically a yellow or Earth Ox, just as it was 60 years ago when I was born. Thus I have seen a full cycle. This is my kanreki year. To celebrate, the person turning 60 years old usually wears red clothing that traditionally includes a red hat (e-boshi) and a sleeveless red vest (chanchanko). The color is symbolic since the word aka-chan or literally, “red one” means baby in Japanese. A 60-year-old person is once again a “baby” who is about to embark on their next 60-year cycle. It is a rebirth. Wearing red symbolizes that renewal of life as the second cycle begins. Sixty-year-olds are expected to use their kanreki as a year of reflection. They are to look at their lives and achievements and then plan which direction they would like to take as their lives begin a second sixty year cycle. And now life begins all over again. This entry was posted in A bit more about me on September 25, 2009 by admin. Gaijin is the word used to describe foreigners in Japan. Literally translated, the word simply means “outsider”, but can be loaded with undertones depending on the attitude of the speaker. And just as in every other country, Japanese attitudes toward foreign immigrants run the political spectrum from conservative to liberal. Often our unfamiliarity with Japanese customs sometimes leaves people annoyed or shocked and sometimes just amused. But there is also curiosity: Why did we foreigners come here? Why do we stay? What do we like about our lives in Japan? And to address those questions, local television shows sometimes like to interview “an interesting gaijin“. So all of that gives a little background of how I wound up taping a segment for Japanese TV this week. The show will air in mid-October, but the taping took place at my house yesterday afternoon. Shown above are Hiroko Hayashi, who translated for me and the director, Takashi Matsushita as they prepared to begin taping. I admit to being quite nervous at the start but both Hiroko-san and Takashi-san were such wonderfully charming and delightful people that I soon relaxed. Sharing my love for Kyoto and talking about how much I have learned from Japanese design made conversation easy. Computer embroidery is a highly developed commercial industry in Japan, but home embroidery machines don’t seem to be as popular here as they are in other countries. Perhaps that’s why the producers found my efforts to digitize so surprising. As he left, the director said he thought it was one of the better segments he had filmed and promised to send me a DVD of the finished segment. So I suppose in a few weeks, I’ll see how it turned out. This entry was posted in A bit more about me, digitizing, Kyoto living on September 23, 2008 by admin. 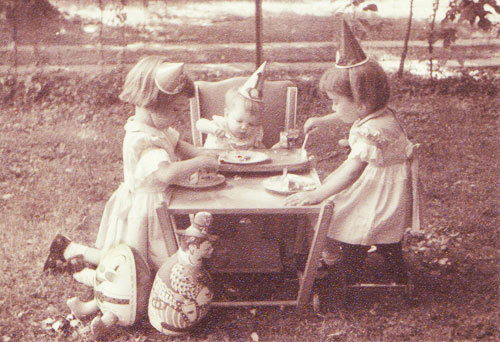 It’s hard to believe that my little blog is celebrating its first birthday, so I thought I’d mark the occasion with a picture from my own first birthday party. There I am between my two older sisters Susan and Paula on the right and left. And now here I am, a long long way from there. August has flown by in a blur of heat an humidity and I’ve barely found time to post, but despite the aggravations of the climate, it’s been a wonderful month of good times with great friends, lots to enjoy and lots to celebrate even though I failed to find time to blog about it all. This entry was posted in A bit more about me on August 29, 2008 by admin. Finally, my website has a front page! I wanted something different, something that reflected me and Kyoto and kimono and sewing and embroidery and just everything. So being associated as I am with an internationally famous manga artist, I asked for a little help. 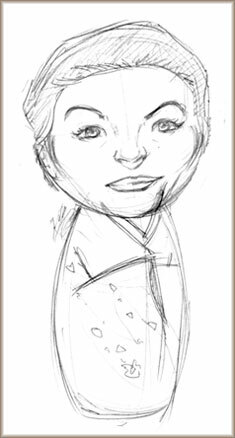 After looking over my site, especially the first post talking about my childhood Ginger dolls, he came up with this sketch of me as a Japanese kokeshi doll. Then he took the sketch and morphed it into a wonderful welcoming entry way for my evolving little website. For those less familiar with kokeshi, here’s a little picture showing the real thing. A classic Japanese toy carved from wood and painted in bright colors. So now come look at me in the final version of my new front page, click here. And to see more work by Mulele Jarvis, the artist who created this wonderful front page for me, click here. This entry was posted in A bit more about me on January 28, 2008 by admin. It’s said that a journey of 10,000 miles starts with a single step, but after a few million steps or so, it’s good to pause for a backward glance and consider the distance you’ve traveled. 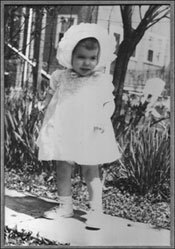 My current life’s journey started with birth in West Virginia, then I grew up in New Jersey, left home for New York City, and raised my own son in San Francisco. 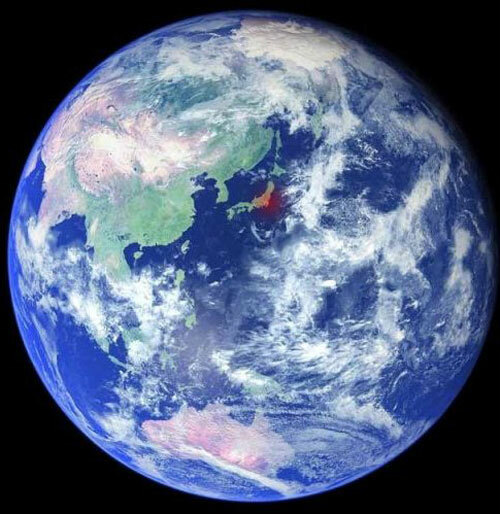 I thought I’d been all over the map, but would anyone have predicted I’d move to Japan? I guess my sense of the map just got a little bigger when I moved here. 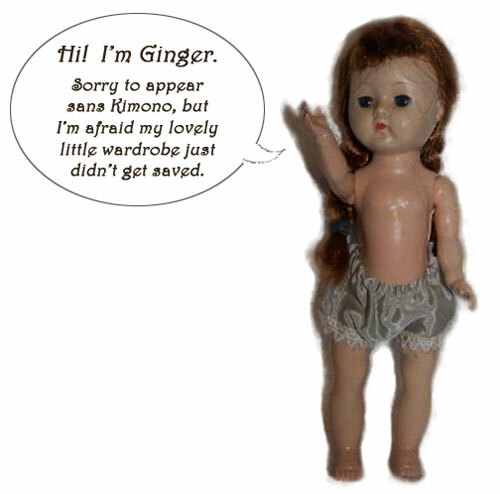 I suppose there might have been a premonition of my travels in the number of childhood hours I spent trying to fabricate miniature kimono for my collection of Ginger dolls. Like so many others with a life-long bent for textiles, I had a seamstress grandmother who must have transmitted her “fabric-loving gene”. But there must have also been some special twist that made a little girl in a New Jersey farming community search out Asian costume books at the town library, then try to replicate the images in doll-size. So now I live in Nishijin, the traditional weaving district of Kyoto where shopping for life-size kimono is one of my favorite pastimes. And in an odd twist on my childhood passion, I now get my kicks converting kimono fabric to western clothes. This entry was posted in A bit more about me, Kyoto living on August 31, 2007 by admin.